JULY 25-27 — The Washington State Labor Council, AFL-CIO will host its 2019 Convention at the SeaTac Doubletree Hotel. Yes, it is Thursday, July 25 through Saturday, July 27. Please note that the convention dates listed in the 2019 WSLC Directory of Organizations are incorrect. The official Convention Call, with registration details and information about how many delegates each WSLC-affiliated union can send, will be mailed to all affiliates 90 days prior to the convention. Are you or anyone you know interested in working for social change? Union Summer is the paid ($16/hour) summer internship program for people interested in getting involved in the labor movement. Union Summer participants will spend an exciting six weeks — June 25-August 2 — working full-time and hands-on with different campaigns — talking to our community, marching for justice, and gaining first-hand experience in the movement. The positions are based in and around Seattle, but campaigns may take place throughout the region. Learn more. 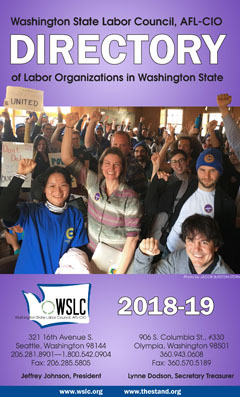 The latest edition of the WSLC Directory of Organizations has been published and mailed to affiliated local unions. (Click here for an electronic version.) Extra copies can be purchased at the WSLC Seattle office for $5 each or by calling 206-281-8901 and requesting it (they) be shipped to you. Unions that would like to submit corrections/updates to their organization’s listing in the WSLC Directory (principal officer, phone, address or contact information), should fill out this form. Hundreds of delegates representing unions across the state gathered July 17-19 in Wenatchee for the 2018 Constitutional Convention of the Washington State Labor Council, AFL-CIO. Under the theme “Union Strong,” the convention featured distinguished guest speakers and educational workshops focused on staying strong amid legal and legislative efforts to take away workers’ freedom to join together in unions. Check out the convention coverage. Also, see the 2018 Resolutions approved by convention delegates. 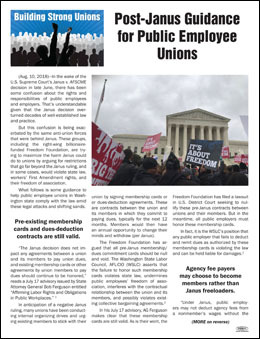 The contents of the Summit Toolkit binder and additional related materials to help affiliated unions prepare for and comply with the Supreme Court’s Janus decision can be found at this website on a password-protected page. Click here to request the link/password. If your union is interested in sharing your internal organizing plans, training materials, message and talking points, membership/ recommitment forms, or other materials related to this effort, please send them to David Groves at dgroves@wslc.org and he will add them to this password-protected site. Inspired by the tradition of the American photo essay in the 1930s, ’40s and ’50s, WA WORK is a series of intimate cinematic portraits of everyday working people in Washington state. Seen together, they form a robust tapestry of the American workplace and what it means to be an American worker in the 21st century. WA WORK is a collaboration between the Washington State Labor Council, AFL-CIO and the film/performance company CABULA6 with funding and support provided through a grant from the Safety and Health Investment Projects program at the Washington State Department of Labor and Industries. Check out these films here. For daily news about organized labor, community allies, and progressive causes in Washington state, check out The Stand. This award-winning news service offers daily news about issues affecting working families via its website, email subscription (get on the list! ), Facebook and Twitter. WSLC-affiliated unions and allied organizations should click here to submit news items and event announcements for The Stand and its Calendar. 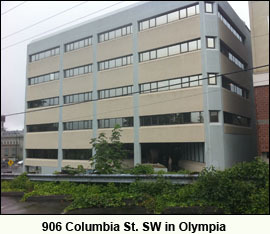 Your union or progressive organization has a unique opportunity to lease office space at Labor’s own building in Olympia, owned and operated by the Washington State Labor Council, and maintained and serviced exclusively by union members. The WSLC’s Davis-Williams Building, a prime location just a couple of blocks from the State Capitol, is fast becoming the hub of organized labor and progressive activity in Olympia. This is your organization’s chance to be where decisions are made, both in the labor movement and in state government. Contact WSLC Secretary Treasurer April Sims for more information or call 206-281-8901. Support union workers, get a 15% discount! 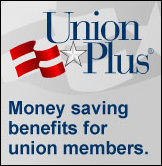 With the Union Plus AT&T Wireless Discount, labor union members save 15% off the regular monthly rate for individual and family wireless cell phone plans with AT&T, the nation’s largest wireless network. Not only do you save 15% off the regular wireless service costs including phone and data plans, but labor union members also receive additional savings on cell phones and accessories. Plus, you’ll be supporting union workers and their families. AT&T is the only wireless company that is completely unionized with some 40,000 AT&T Mobility employees are represented by the CWA. Learn more. 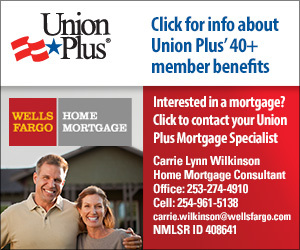 Also, learn more about the exclusive benefits available to active and retired union members through the Union Plus Mortgage Program by emailing Home Mortgage Consultant Carrie Lynn Wilkinson or calling her at 253-274-4910. The Washington State Labor Council, AFL-CIO has received many inquiries from injured workers and others interested in contacting attorneys with experience in workers’ compensation law, especially since the state has begun allowing “structured settlements” of workers’ comp claims in certain cases. The WSLC has compiled a list of attorneys in Washington state with workers’ compensation experience. DISCLAIMER: The Washington State Labor Council, AFL-CIO (WSLC) assumes no responsibility or liability for the professional ability or reputation of, or the quality of services provided by, the following persons or firms. Inclusion on this list is in no way an endorsement by the WSLC. Names are listed alphabetically, by city, and the order in which they appear has no significance.